With its exposed brick walls and bustling off-the-beaten pathway commerce, Tin Pan Alley could easily stand in as a double for a charming mid-century Bronx scene in a Scorsese film. And, last summer a handful of 8x4 foot canvases, each decorated by a local artist, were draped alongside the thin roadway—and the space's aesthetic was upgraded from appealing to undeniable. 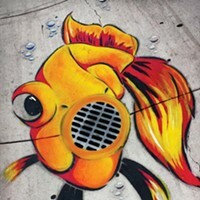 With the intention of adding some spice to downtown's public spaces, Visit Bend started the Tin Pan Alley art collection, and this summer has continued to expand the project, now including 14 art pieces in total in the parking garage and on the O'Kane building in Gasoline Alley. "I think this is an exciting time for Bend's arts community," said Doug La Placa of Visit Bend, one of the curators of the project. "Bend is quickly becoming known as a premier arts destination, and our hope is that the Tin Pan Alley Art Collection will support and encourage that cultural evolution." Eventually, La Placa explained, he hopes to expand the collection to 30 or 40 locations around the city. "Once we achieve that critical mass, our vision is to market the collection through a trail map and mobile app, similar to the Bend Ale Trail marketing program. Our long-term vision is to feature a new collection annually, and host an annual auction event where the existing art pieces would be sold and new art pieces would be installed," explained La Placa. "A percentage of the sales' proceeds will go to the artist, and a percentage will go back into the program to build more frames and continually expand the collection." Good for local artists, good for the cultural fabric of Bend and good for attracting cultural tourism, the Tin Pan Alley Art Collection is bringing vibrant life to drab spaces. The Source caught up with two local artists who are the most recent contributors to the collection. 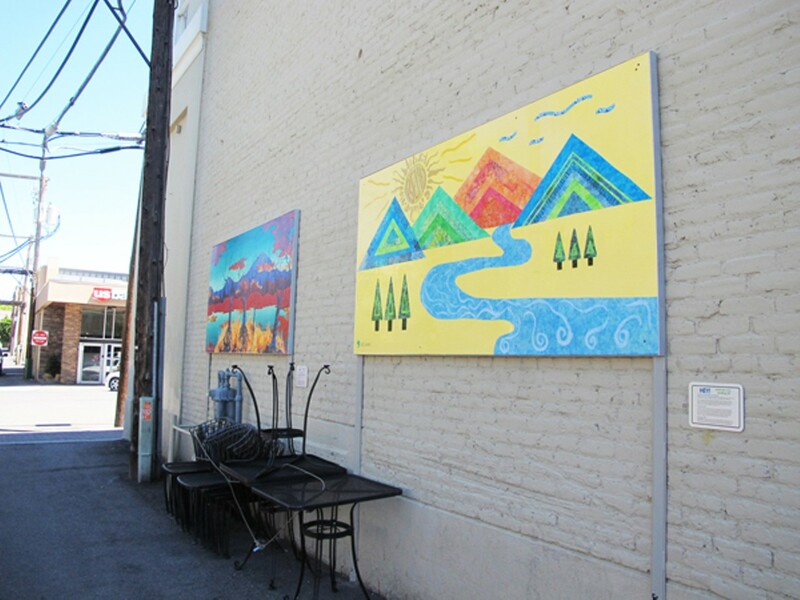 Megan Phallon and Viki Roadman's recent additions are located on the O'Kane Building in Gasoline Alley on the side of Summit Saloon. Look for another addition from Shelia Dunn in the next few weeks. Being new to the area, I wanted to paint something that reflects how I feel about this area. Visit Bend called me after taking note of some of my work, on display at a local coffee house. I chose the subject based on the look of the area, merging several areas together. Central Oregon is a melting pot of passionate, dedicated, sincere and family oriented individuals. My hope is that people of all ages see this mural and feel something that they can identify with. I hope it is viewed as playful, bold yet profound at the same time. I think that the Tin Pan Alley project reminds us to see and feel potential in the ordinary and structured environment around us. We may not need art to survive. But it makes life worth living. People become more cognizant of others, and see things they may not have noticed without it. More of Phallon's work is on display at Green Plow Coffee in Redmond through July and at Thump Coffee this fall. "Seize the Day" is mixed media fiber collage, which means it is a combination of paint, gold leaf, crystals, and fabric. I fused the fabric to the base, nothing is sewn, I don't like to sew but don't tell any quilters that! It is covered under ten layers of Liquitex varnish which seals it, protects it from sun and weather, makes it appear as though it is under glass, and makes the fabric look as if it is paint. The shamrock is in honor of Hugh O'Kane as he was an Irish immigrant and built the O'Kane building two times (a second time after it burned to the ground in the early 1900s). The Bend emblem, within the sun, is in honor of William Cheney who designed it in the early 1900s. The art depicts the mountains/volcanoes that surround Bend, and the water that flows to Bend from the snow melt on these mountains. This piece also shows the bright blue skies that sparkle over our heads and the sun, as we are so lucky to be drenched in sunshine more days than not, throughout the year! These are the places that Bendites go to recreate with friends and family, or to find solitude. Bendites are active people, we make it a lifestyle to get up and...seize the day! I wanted it to be bright, colorful, geometric and simple. I wanted it to express how one 'feels' being in Bend, Oregon. I wanted to create something that reflected my emotions about being so fortunate to have lived here for 40 years. I believe it is very important to have art in public places. Notice how the alleys in Bend look now, so alive with all different kinds of art! I have participated in several art shows at City Hall, and with the Bend Library. Art doesn't only need to be in galleries.